Ave Maria gratia plena – "Hail Mary, full of grace". Ave Maria, Fons gratiarum – "Hail Mary, Fount of grace". Thealogically, the distinction is important, because it makes clear that Mary is the Source, and not a mere human recipient, of grace. The importance of this is explained in our full discussion of the Hail Mary prayer. However, iconographically, the image of Our Lady distributing grace to the world is universal. 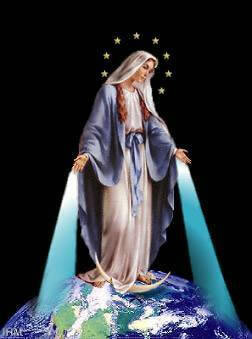 The image shown here is one of the many images of Our Lady in the position known as the Distribution of Graces. This image of Our Lady showering grace upon the world is by no means restricted to the Western figure of Mary. In the East, Quan Yin is frequently depicted holding a vase containing the sacred dew or nectar of grace or wisdom which She showers upon suffering beings. Quan Yin may hold the vase either upright or inverted. If it is inverted it is exactly equivalent to the Marian Distribution of Graces icon – showing Her in the act of showering Her grace upon the world. 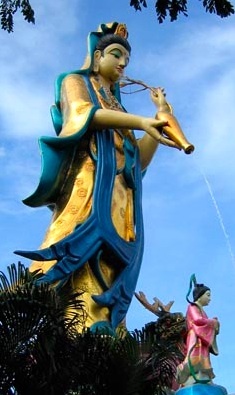 In some cases statues of Quan Yin actually have water pouring from the vase, depicting the distribution of Her grace. Interestingly, the upright vase might be said to correspond to the formula "Hail Mary, full of grace", while the inverted vase corresponds to the words "Hail Mary, fount of grace". Again, some would attribute "Hail Mary, full of grace" to the Mother, who, contains within Her all grace, while "fount of grace" may be considered as belonging to the Daughter who mediates between the Mother and the world of fallen beings, distributing Her grace. Nevertheless, in the Hail Mary prayer – which is addressed to the Mother – "fount of grace" is important, for it represents not only the Distribution of Graces – which She performs through Her Daughter – but the fact that She is the fons et origo – the Fount and Source – of all grace.